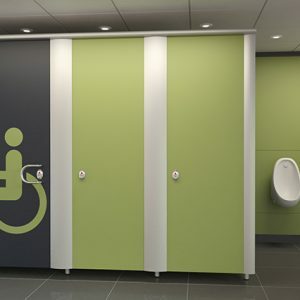 Designed to make using the washroom simpler for those who are handicapped or disabled, the Disabled Washroom doors with Automatic Doors open and close automatically. With innovative interior switches, the door is able to remain closed until the occupant is ready to leave the cubicle and is then able to operate the switch again which will cause the door to open. 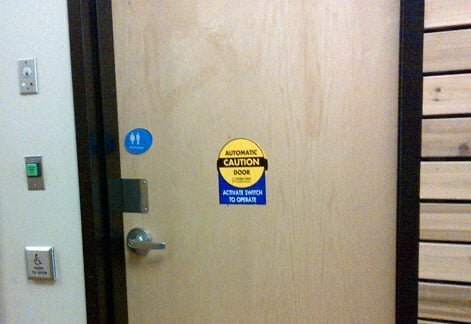 Each time the door is open, it remains open for a predetermined hold-open time to allow the user enough time to get in and out of the cubical safely and at their own pace. In case of emergency situations, there is a switch option that immediately opens the door, while in the case of a power failure the door can be pushed/ pulled open or manually opened from the outside with a key.